Latex backed carpet is heat-formed based on pattern-specific design molds and mounted to a rigid HDPE or vacuum-formed ABS backing. Depending on the application and space available for mounting, the Pocket Pods design can include one, two or three storage pockets. 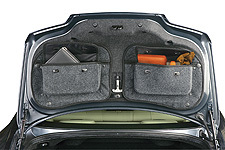 If trunk mounted, the design always allows easy access to the inside trunk safety release handle. Additional storage for smaller loose items like: manuals - wax, polish, detailing products - tire pressure gauges - emergency tools - warning devices, etc. New patterns and molds are now in the design and engineering process. Below are the patterns currently available. Check back for updates. This is a SINGLE unit for ONE seat.